I’m a little more than half way between 30 and 31, which means I should be half way through my 30 While 30 list. Not quite. Documenting this recipe gives me a 25% completion rate. While I haven’t gotten very far, I’ve enjoyed trying new things… who knew that homemade hummus and pita would be so easy and delicious? Of course, there have been some misses that haven’t been documented on Domestic Pursuits. I made fudge two days before Christmas, following a very precise recipe by Alton Brown. Something went wrong and I ended up with a grainy mess that didn’t set properly. Oh well. I’ll get there some day… besides, who says fudge is just for the holidays? I also fully intended to decorate some of my Christmas sugar cookies with royal icing – I even bought the supplies. With visions of snowmen, decorated trees and sparkling stars dancing in my head, I made the same sugar cookies that I’ve made my whole life…and left out the SUGAR. Yum. That was a bit of a setback that cut into my already tight timeline. Look for some hearts or Easter eggs in the coming months. Finally, there was the herbed asiago foccaccia that didn’t rise, but it sure made for some tasty breadsticks. Take two will be attempted soon. Getting back to the recipe at hand: this pita came together quickly and easily with very little attended preparation. For the longest time, I was intimidated by yeast. I can’t articulate why, but it just seemed so complicated. 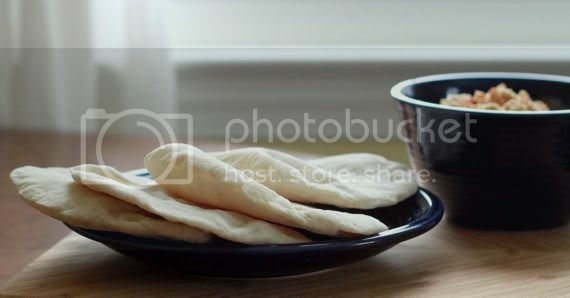 I’m so glad I overcame my issues, because homemade bread products, including this pita, have a much fresher and more pronounced flavor then their store-bought counterparts. Paired with homemade hummus, this pita is a fabulous snack. 1. Add flour, salt and yeast to the work bowl of a food processor fitted with the steel blade and process for 5 seconds. 2. Add the tablespoon of oil and water through the feed tube while the processor is running. Process for about 30 seconds, then turn off and remove the cover. At this point, the dough should be a well-defined ball that’s easy to handle and barely sticky. If it’s too dry, add more later 1 tablespoon at a time, processing for 5-10 seconds after each addition. If it’s too wet, add 1-2 tablespoons of flour, processing briefly after each addition. 3. Transfer the dough to a lightly floured surface and knead for about 1 minute. 4. Lightly oil a large bowl. Place the dough in the oiled bowl and cover, letting it rise until it has doubled in bulk (about 2 hours). 5. Deflate the dough ball and divide into 6-12 even pieces. Make sure you keep all pieces lightly floured and covered. 6. Preheat the oven to 500 degrees F. Place a baking stone in the oven as it preheats. If you do not have a stone, use a cookie sheet. 7. On a lightly floured surface, flatten each piece of dough into a disk and roll out into a 6-8 inch circle. Keep each completed circle lightly floured (on both sides) and covered. Do not stack the disks. 8. When the oven is preheated, place a few pitas on the stone (I could fit 4 on my pizza stone). In 2-3 minutes the dough will puff up. Remove from the oven and repeat the process until all of the dough has been baked. I will loan you my Easter Cookie Cutter set if you want. There is a super cute carrot. Just sayin’. I might have to take you up on your offer! I think that would be the perfect opportunity for cute cookies.